Cpl. Tick was a two-year-old, friendly black lab. She was a decorated Marine. And she was a hero. Last year Cpl. Tick and her handler, Lance Cpl. Bryan Utrilla were attached to Echo Company, 2nd Battalion, 5th Marines at Combat Outpost Shir Ghazay near the town of Musa Qala in Helmand province Afghanistan, assigned to patrol the region for Improvised Explosive Devices. Utrilla told me by email that Cpl. Tick was a natural when it came to getting the job done. Utrilla and Cpl. Tick had been together since October 2011, when 2/5 adopted the dog from the Southern Pines, N.C. company K2 Solutions. It was the first time the unit had ever brought in Improvised Detection Dogs. For Utrilla, the five-week training course with the dog focused on learning to recognize her reactions and responses to the odor and residue of explosives, as well as proper cleaning and care for her. When they arrived in Afghanistan in late February 2012, they got right to work. “We went on countless patrols throughout the area, interdicting the Taliban,” Utrilla said. A hard worker, Cpl. Tick was also a good friend. On May 14, they embarked on their last patrol. The pair were on a mounted convoy en route to a well-known IED hot spot. The convoy stopped when lookouts noticed a disturbance in the road. Utrilla and Cpl. Tick were dispatched to check it out. Utrilla recalled that an Afghan National Army soldier had stepped on a five-pound IED not far from the location a few days earlier, and suspected this could be a secondary IED. “Hunt it up,” Utrilla told Cpl. Tick, and she ran to obey. Utrilla could see she was getting very close and about to “cover down,” indicating she was right on top of the explosives. Suddenly, the IED detonated. Utrilla was shaken by the blast, but Cpl. Tick absorbed the worst of it. She was killed instantly. “It was a pretty devastating loss to the squad, not only because she was probably the most dedicated dog out of seven in the company but also (because she was) a great friend to the squad. She definitely made the guys smile when times were bad,” he said. For their brave work that day, which prevented the deaths of other Marines, Utrilla and Cpl. 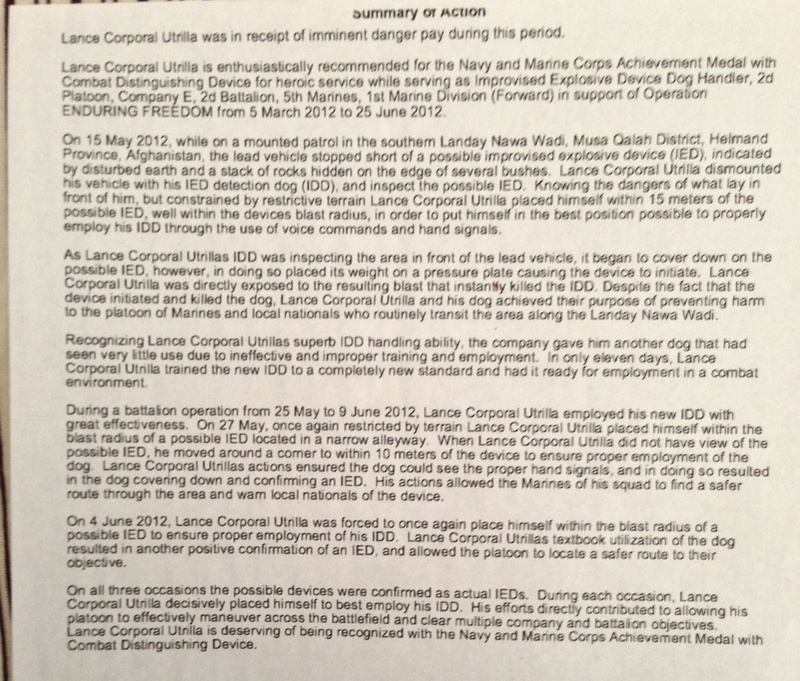 Tick earned a Navy and Marine Corps Commendation with combat V device. 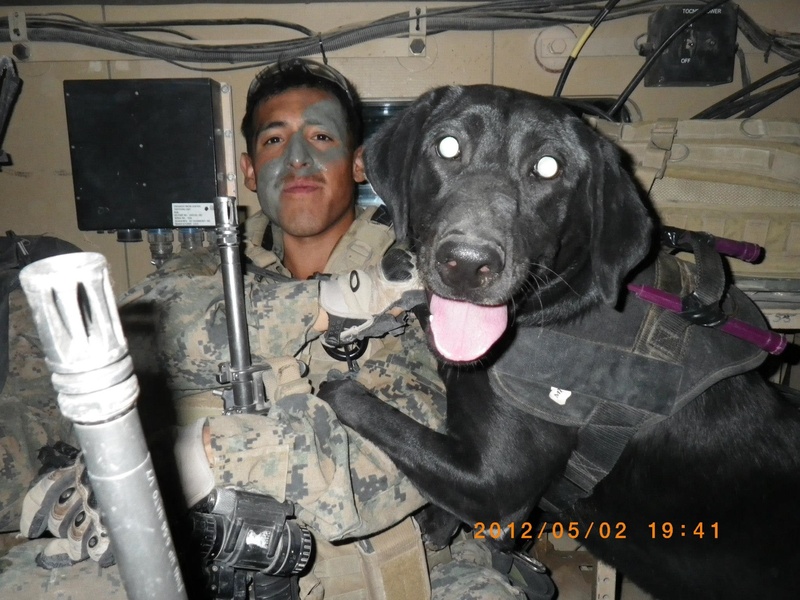 “Despite the face that the device initiated and killed the dog, Lance Cpl. 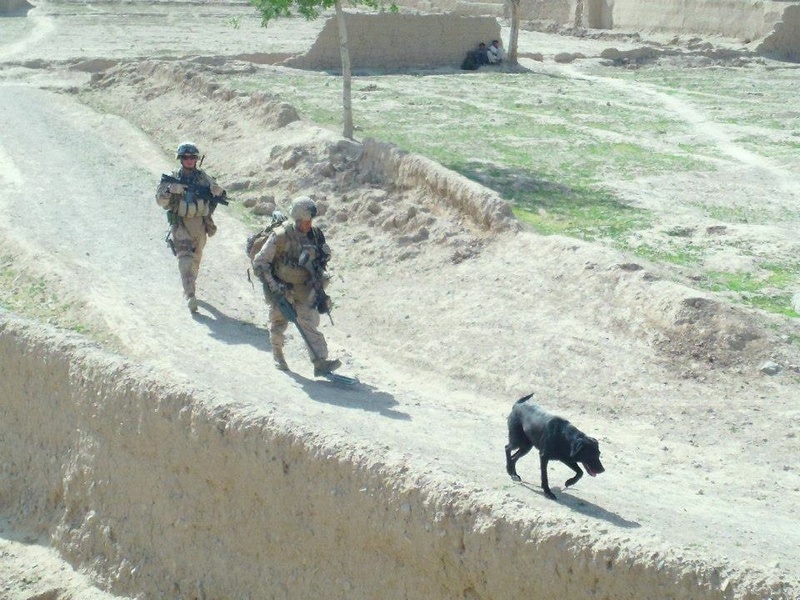 Utrilla and his dog achieved their purpose of preventing harm to the platoon of Marines and local nationals who routinely transit the area along the Landay Nawa Wadi,” the citation said. Utrilla was quickly paired up with another IDD, but he never forgot about his first battle buddy. On May 14, the anniversary of Cpl. Tick’s death, he and some friends will run up First Sergeant’s Hill to the famous memorial cross aboard Camp Pendleton to place her dog tags at the top. They will be the first tags from a military working dog to be added to the memorial, Utrilla said. I wished could have served with Cpl.Tick. I served with 2/5 echo as a 0331 and 0311 during the invasion and remember our dog handlers. I wish the best and OUTSTANDING job for Cpl.Tick. Please send pictures of First Sergeants hill tags. A good story about a man and his best friend. Run up 1stSgt’s Hill with pride my friend when you Cpl Tick’s tags up there on the memorial. Remember Cpl Tick lived up to the oath “Semper Fidelis”. I am fostering a future Military Working Dog, a puppy named Qquail. I hope someday she will follow the pawsteps as Cpl Tick. Monica, how do you become a foster for future military working dogs? I would be interested to know. wonderful story. bless you and sorry for your loss. Well i knew these two personally, and was one of the other six handlers that was in shir ghazay with these two, i remember seeing Utrilla always out training with Tick or incorporating her into his day far more than most of the handlers ever thought to. And after the IED he took extreme care of her ashes. Of all things that was one container Utrilla never lost track of. He formed a quick bond with his next IDD (tag) and had even been filling out the papers to adopt Tag after he discharged from the Marine Corps. As tag had once been my own IDD i can only hope that it was approved. I cant think of anyone else whom i would rather see tag with.